The October Innocent+Twisted Alchemy subscription arrived! It was wrapped so cutely I almost didn't want to open it! If you read my review for this sub last month, I mentioned that October will be the last month of this subscription until 2015. If you missed it, Linda the owner, works retail so she is putting it on hold for November and December, and it will recommence in January. This subscription is sent via USPS only about 30 minutes from me, but this one took 3 days to arrive because of the long holiday weekend. Linda didn't have a chance to draw the artwork on the info card this month, but it was done by Angela Drake at remanic.deviantart.com. 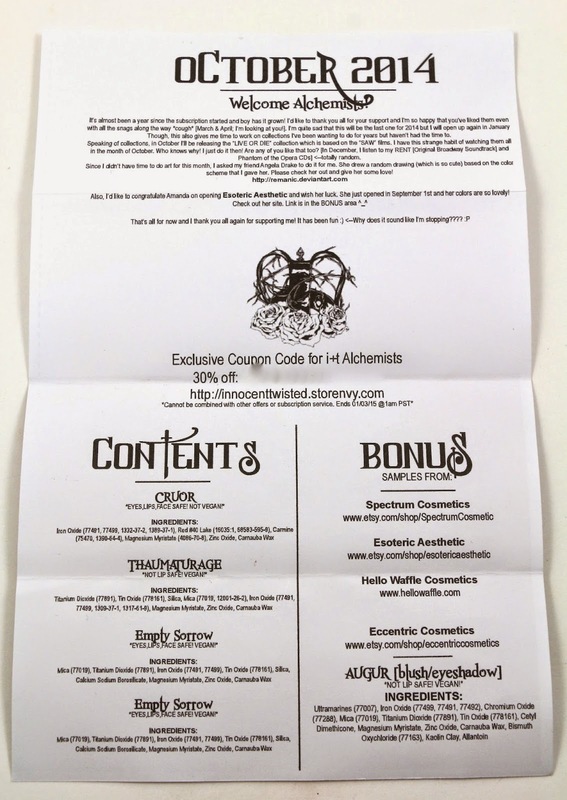 Here's what the inside of the info card looks like, Linda always writes a little about this month's subscription at the top, the discount code for subscribers is in the middle, and at the bottom are the shadows and bonuses. There was a little typo with the names of the shadows this month, one of the "Empty Sorrows" should have been "Hallowing Voice." The one thing I wish the info card had was a description of the shadows just to help me describe them. And I like including that sort of information in a review. 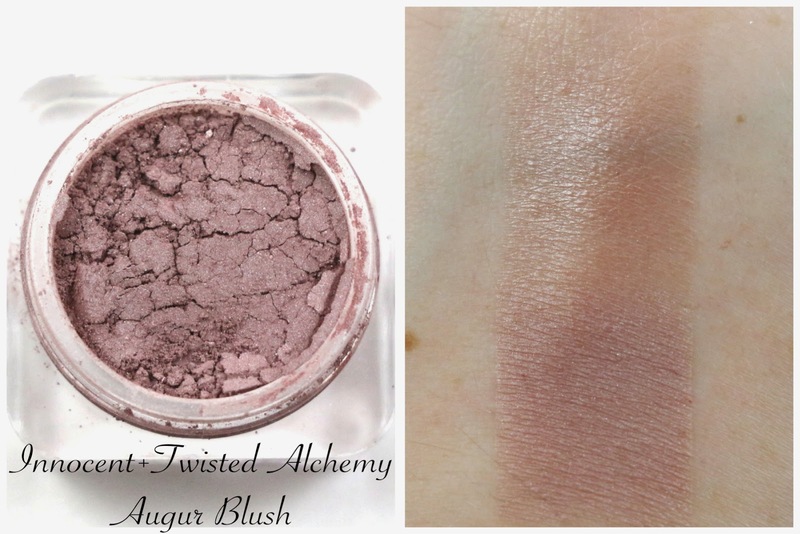 Augur Blush - Swatch patted on over Too Faced Shadow Insurance primer on the bottom, blended out, no primer on the top. This is a really pretty blush, kind of a taupe-y muted rose color. 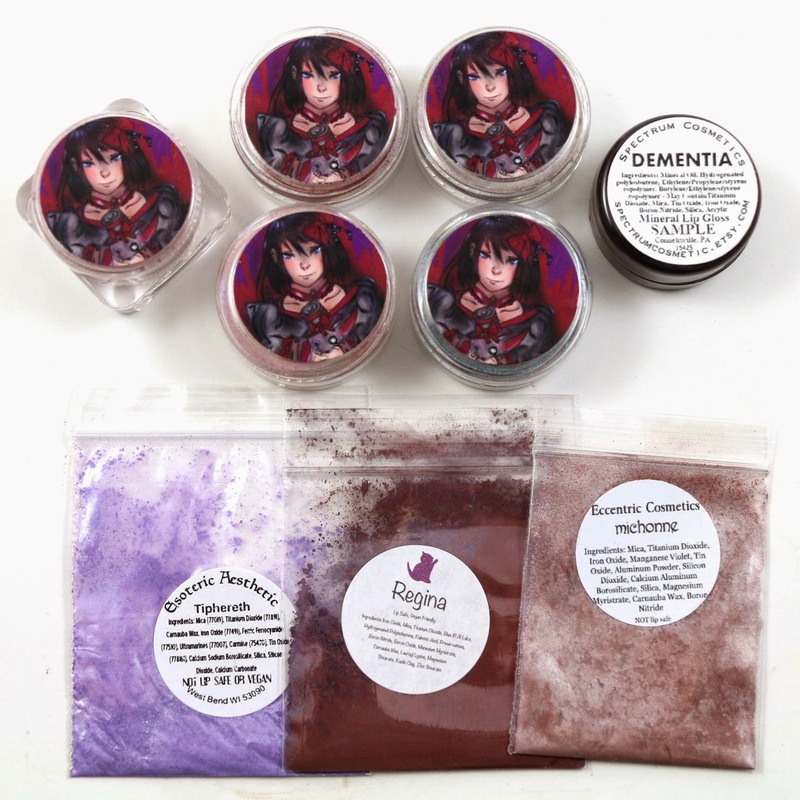 I also like that the jar for this is a different shape, that way I can easily find it in my stash that has now overflowed into an empty Memebox box. I think if I can be light-handed enough with this it will look really nice over my cool toned fair skin. This is like a matte deep burgundy/brick red color, and I really like it. I get a lot of shimmery shades with indies, and indie subscriptions, that it's really nice to get a matte shadow every once in a while. I've only been getting this particular subscription for two months now, but so far there have been matte shades both months. I hope that's a regular thing because I am seriously lacking some mattes! I would describe this as a taupe/gunmetal gray, with silvery sheen, and possibly blue glitter. 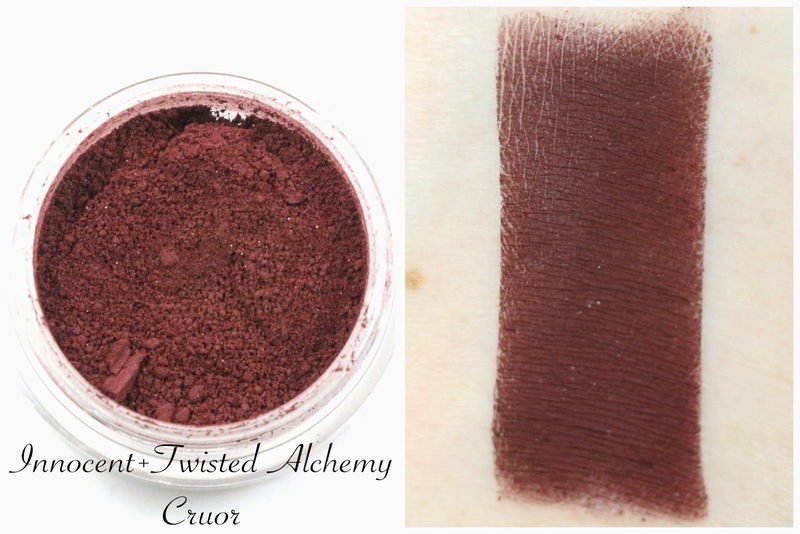 Definitely a good neutral to have, I think it would look great paired with any of the other shadows in this month's subscription. This is a rosy pink with a silvery purple sheen. Sometimes I forget how much I like pinks as eyeshadow, as they tend to look very nice with my skin tone and eye color, but this one will be perfect. Light enough for a professional look, but would also look great paired with a darker more dramatic color. A deep teal with black undertones and a silver sheen. I'm terrible at describing shades, I really do wish these came with a description. This may be my favorite shade this month though, it's quite unique to my collection, but I could probably never spell the name without double checking! 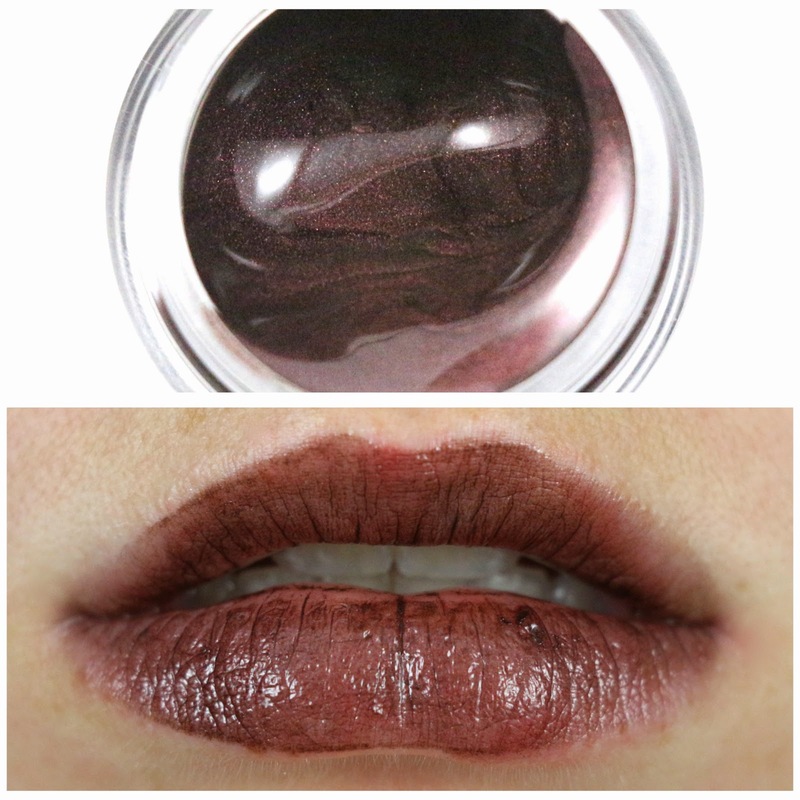 Spectrum Cosmetics Dementia - "A lovely Dark Purple Gloss with sparkle." I tried, I really did, to get this gloss to work. It's not pigmented, it's slippery, it hugs the lines, flakes, and it just would not look good. 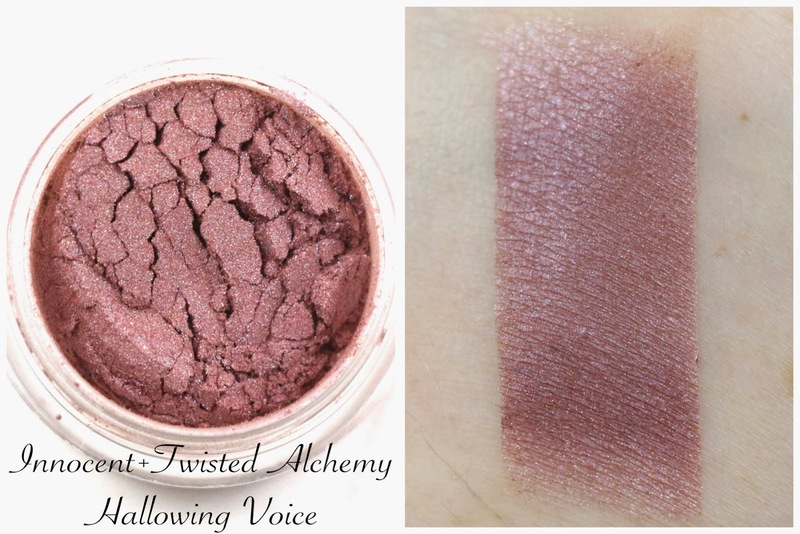 I saw the side of the jar of this before I read what it was, and I was so excited because I thought it was an eyeshadow, which they do actually sell this as. But after experiencing this gloss, I probably would not be willing to buy anything else from this company. 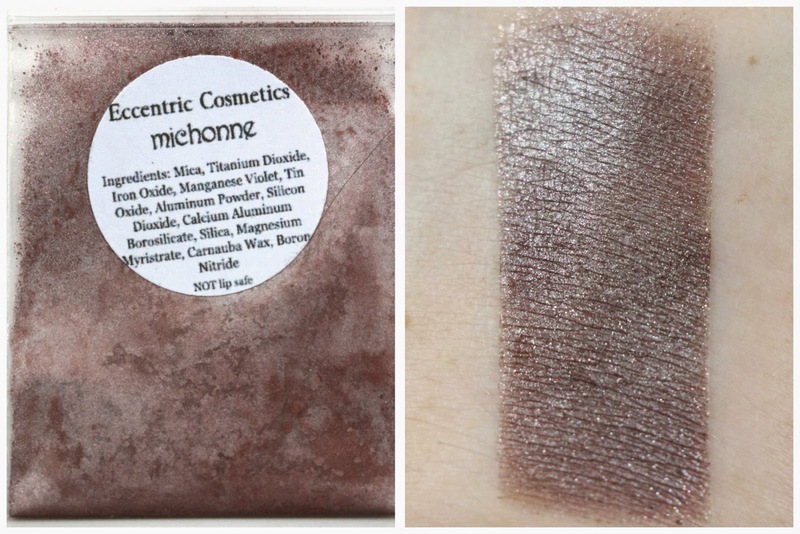 Eccentric Cosmetics Michonne - "Dark matte reddish brown base with a silver overlay, filled with red sparks." A Walking Dead eyeshadow! I'm actually watching it as I write this, so I'm really glad this was an included extra. 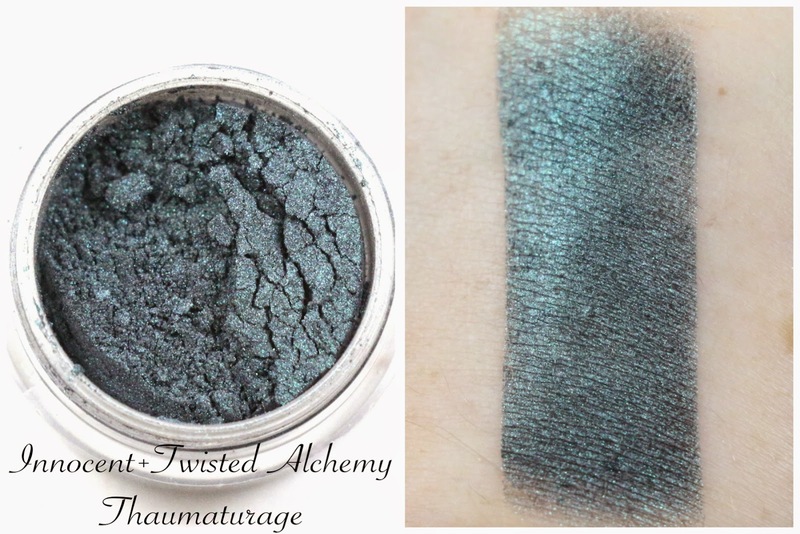 I'm tempted to get the whole collection as they are really pretty shadows! And I love this particular shade, it reminds me of Michonne's sword. And a brand I haven't heard of! It's always nice discovering something new that you wouldn't have otherwise known about. 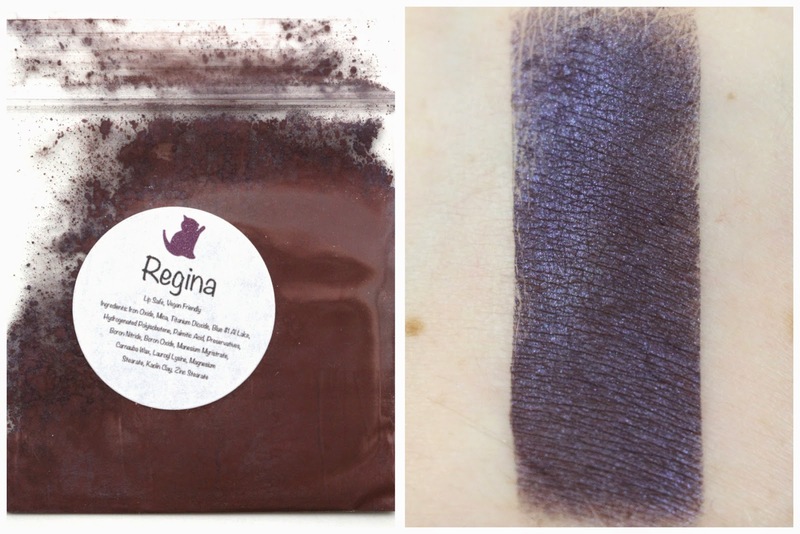 Hello Waffle Regina - "Dark indigo with a periwinkle glow." When I was swatching this, I had no idea, but it's actually supposed to be a blush! I swatched it like an eyeshadow, but it would be very pretty as that or as a blush. 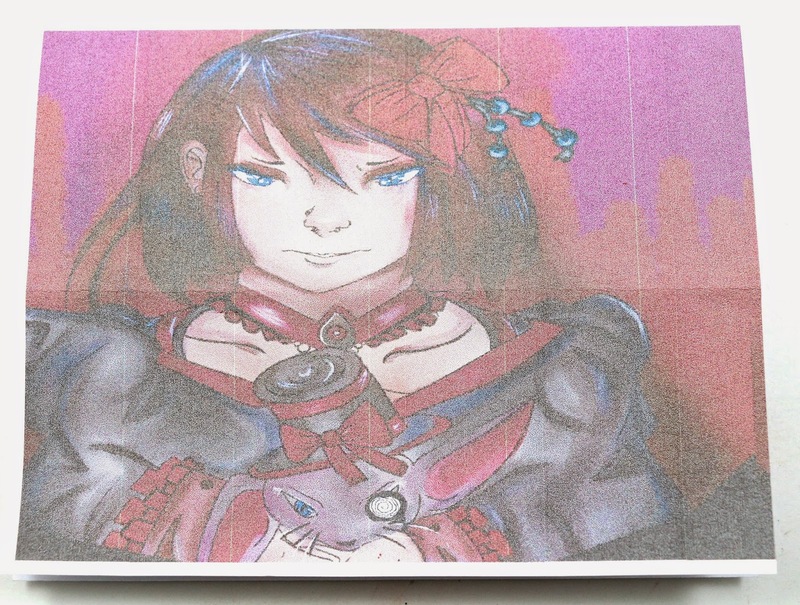 I forgot the pink Waffle cat signifies the product is a blush, and a black Waffle cat on the label is an eyeshadow. I'll eventually be doing a big Hello Waffle blush review, so I'll throw this one in with it. I was a little sad, because I actually wanted it to look like the color shown in the bag, but it doesn't. 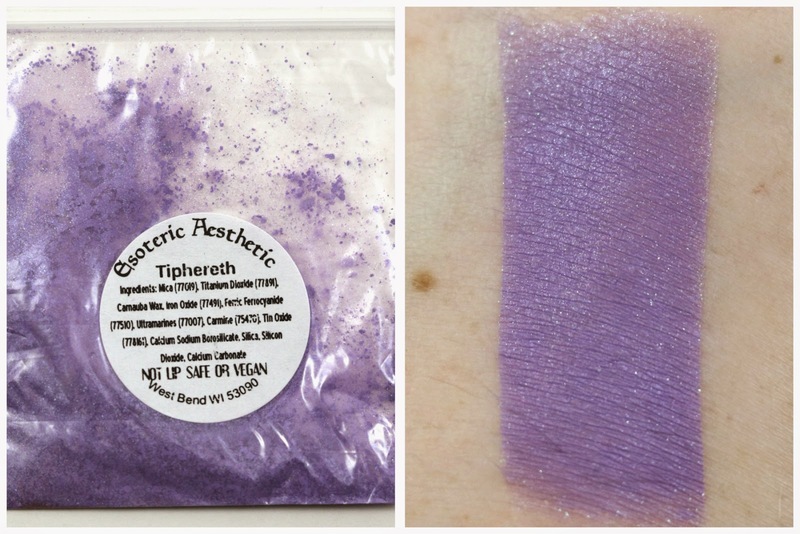 Esoteric Aesthetic Tiphereth - "A beautiful medium purple balanced by green shimmer." I would describe this as more of a lavender purple, and I don't quite know how I would use this in a look, but it would definitely look nice in the Spring as an eyeliner by itself. Maybe for Easter or something. Pastels remind me of Spring. But I have never heard of this brand, so it's nice to be able to discover various brands from indie subscriptions. 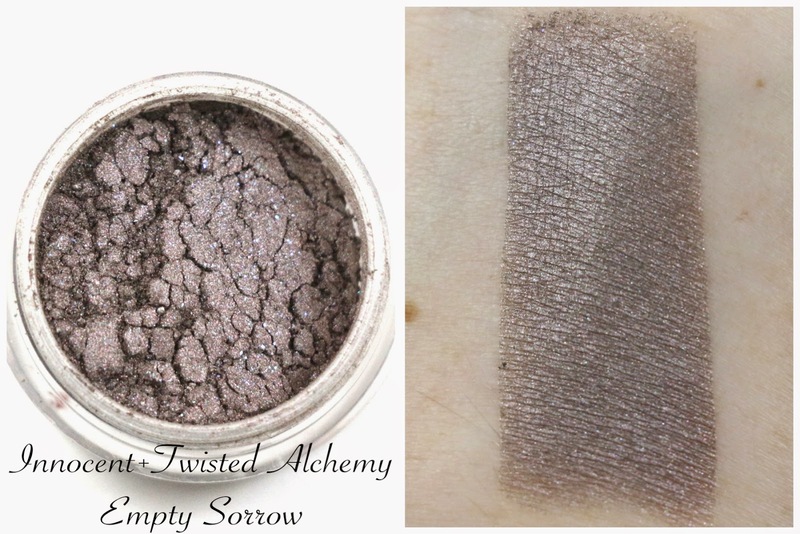 Overall, I think this month's Innocent+Twisted Alchemy subscription was a total hit, I love almost all of the products in it, except the lip gloss, but they were for the most part seasonally appropriate. I like the inclusion of a matte shadow, and some from new brands to me, and two blushes, and a lip product. Just a good variety of products, and the sizes from Innocent+Twisted Alchemy this month were huge! Last month the minis were clamshells, and these came in jars, pretty excited about that. I wonder if she wanted to pull out all the stops for the last sub before the short holiday hiatus. If so, I totally approve! What did you think of this month's Innocent+Twisted Alchemy subscription? Let me know in the comments!